Tavallinen kauluspaita Tsekkoslovakiasta. Tosi askeettinen, tosi hyvä ja halpakin vielä. Tämä on erittäin yksinkertainen, kokonapituksella varustettu kauluspaita. Kangas on tommoista ohutta, vähän vaihtelevilla materiaalipitoisuuksilla ja väreillä (katso kuvat). Koot ilmoitettu senteissä, normaaleina kauluspaitakokoina. Sopiva paidan koko saadaan pyöräyttämällä mittanauhaa kaulan ympäri, kaksi senttiä aataminomenan alta, siitä kohdalta, mistä kauluspaidan ylin nappi kiinnittyy. Olemme heittäneet perään vielä arvioidun "helpon" koon. Joko uudenveroista tai sitten erittäin minimaalisesti käyttöä nähnyttä tavaraa. 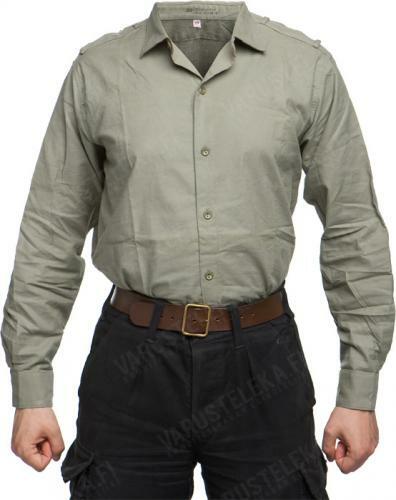 Great shirt, good quality, suitable for wear even in the civilian world. I give it 4 stars because it got some rust from the sewing needles it came with. Apart of that, very nice shirt. Fits nice, and it´s very light. Cool color too. You don´t find such a shirt very often. I´ll order one more. These shirts are well worth the ridiculously low price. I got a size 38 and it fits a bit large on me but still okay. These are not fitted, so don't expect it to fit like a Brooks Bros. shirt. 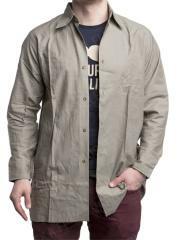 Perfectly serviceable for a work shirt or something to wear under a sweater. Mine came with some pilling on the fabric and loose threads, but nothing that couldn't be fixed with a lint roller and needle and thread. It has a nice musty odor from storage, but not too strong. Depending on how long my current shirt lasts, I may be getting this again. I ordered a second shirt, which arrived factory folded and pinned to a cardboard backing. After removing all the fiddly clothing pins, I could see that this shirt was of slightly newer construction than my first. The fabric blend it slightly more stiff, probably with more polyester in it than my first. No pilling on the fabric and the button holes and seams appear to be of better construction. The color is much lighter, closer to the first two pictures above, while my first is a darker green, almost olive. The fit of the new one is closer to a modern dress shirt. In terms of comfort and style, I think the first shirt I purchased is my favorite, but the second shirt will still work very well and even looks better at the office. No complaints. I'm tempted to get a third to see how it will differ from the first two, but I have enough shirts now to last me quite a while. High quality shirt. I wore mine Easter Sunday to church. Fantastic shirt, dirt cheap and fit perfectly. Mine came in reasonably good nick, dated 1989. Really, really comfortable with a nice long hem to keep it nicely tucked in. 'Tis a smart looking shirt for casual use, will definitely pick some more up if they happen to get restocked in my size.